Normally I’ve been doing a post on the last Friday of the month to share some of the things I’ve been working on during the previous month. Since last week I was on an island with limited and spotty internet service, I decided to postpone until this week. I could have written and scheduled a post before I left on the trip but I knew my time there would be a major part of September’s work. The following two quotes made themselves known to me while I was on a week’s retreat with only me and my camera and they sort of sum up the whole experience. Yes, I spent a whole week alone in a cottage and on the beaches, and on the rocks and the back roads (they’re ALL back roads) on Block Island, Rhode Island. I have a great deal to process, literally and figuratively. Over 1500 images will be source material for many months, if not years. And some of my reactions to having that much unscheduled time were enlightening and will be food for thought for a lifetime. My first full day there dawned with heavy rain so I tried to enjoy the calm but was anxious to get out and shoot. By mid-morning, the rain had cleared so I headed to the north point of the island where there is a very picturesque beach and lighthouse. The light was still rather grey and flat and I seemed all thumbs when it came to doing the long exposures that I had planned. Nothing seemed to be working and I was frustrated. After an hour or more, I left that location and headed to another part of the island but nothing particularly inspired me. I went back to the cottage and did some planning and research for other locations, downloaded my images from the morning, and, typical of my first look at images, decided they were all crap. I tried this and that but couldn’t shake a vague sense of anxiousness. It went that way till about midday Monday when it dawned on me that I was feeling pressure to “produce”. The blood of my puritan ancestors runs deep at times. One must be productive, have something worthwhile to show for your time. What is productive and what is worthwhile? I realized that I felt this need, this responsibility to create something amazing that was “worthy” of having spent the time and money on this retreat. This was different than going to a week-long class taught by a BNF (big name in the field). Then I was “getting” something concrete for my money and time but how would/could that be true for this week? WOW, what a load of crap! A couple of days later I came across MacDonald’s quote in a tiny little book of quotes that I picked up in the island book store, “Work is not always required. There is such a thing as sacred idleness.” That was after I’d mostly rid myself of the pressure to produce, but it still resonated and I don’t think I will ever forget that beautiful phrase, “sacred idleness”. Why is it that we don’t know how, or resist, play so much?! When I am not anxious about producing, my work is actually play to me and I often do some of my best creations. In the end, I definitely got the message and came home filled with peace and calm in addition to some really cool, playful new images. So… many more words than you are accustomed to from me. How, in your life, do you resist play and sacred idleness? Find at least a few moments of “sacred idleness” this week. This entry was posted in Practicing, Sharing and tagged Block Island, Creativity, Flowers, Inspiration, Nature, Play, Sunflowers on October 4, 2013 by gail. The mandalas last week were daisies in re-imagined form. The source image was a very large single daisy (or maybe a white sunflower?) and the mandalas all seemed to be new definitions of what a daisy looks like. Many people commented to me about those images and one actually requested that I try to do that with a sunflower; the kind we normally think of as a sunflower, blazing golden-yellow and infinitely joy inducing. In January, the mandalas here in this post were sunflowers re-imagined. 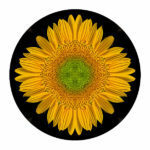 In that case I, basically, only re-imagined the center, the face of the sunflowers. Instead of that wonderful spiral, each face now had a new, intricate pattern. But the petals, for the most part, remained in a halo around the center as opposed to last week’s daisies which sported entirely new petal designs that often bore no resemblance to a circle. So, by request, here are a few new re-imagined sunflowers. Of course, if a different source image was used, entirely different re-imaginings would emerge. That’s the never ending joy of it! This entry was posted in Mandalas, Practicing, Seeing and tagged Flowers, Mandalas, Patterns, Sunflowers on March 11, 2013 by gail. A couple of weeks ago, I spent a lovely couple of afternoons with my studio lights, a black velvet background, a couple of bouquets of flowers from the grocery store, and of course, my camera. The weather was dreadful outside but my attention was fully focused on some luscious red tulips, some pale lavender daisies, and one very large daisy. I rarely, if ever, photograph a whole group of flowers, preferring instead to focus attention on one individaul flower, one part of that flower, or a unique perspective. It is intriguing, I find, to be able to show the flower in ways that we don’t typically experience it. The large daisy was more like a white sunflower, about 5 inches across and a big puffy green center. I’d never seen a daisy or sunflower exactly like this one. Since it was a grocery store bouquet, I couldn’t ask anyone what it was. Online sleuthing hasn’t yielded an identification yet but I’ll keep looking. I didn’t take the images with the intention of using them for mandalas and I’ve yet to totally explore all the images I created in those afternoons. When I was thinking about mandalas, though, I thought I’d see what would emerge from one of the daisy/sunflower images. This entry was posted in Mandalas, Practicing, Seeing and tagged Daisies, Daisy, Flowers, Mandalas, Patterns, Sunflowers on March 4, 2013 by gail. I’m not a big fan of winter. It’s now the beginning of February and I feel like I haven’t been warm in months. The sun is shining as I write this but that is a rarity in this land of eternal cloud cover. BUT, it is 3 degrees! Fahrenheit! Of course that is an improvement of 15 or 20 degrees over last week. To survive the winters, I have to create my own version of sunshine and warmth. That’s what I thought I would do with today’s mandalas. This is no flower more capable of making me and most people smile than a sunflower. 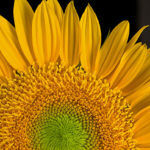 The original image used here is a sunflower from our garden that I photographed in the studio last summer. 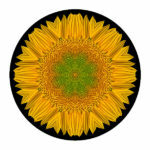 I always think that sunflowers are, already, mandalas. That beautiful and amazing Fibonacci spiral in the center never fails to intrigue me. As I played with this image and made a few mandalas, discarded a few, and then realized that I could create new types of sunflowers with different patterns in the center. In no way do I think these are an improvement over that fascinating pattern that is present in all sunflowers, they are just different. Re-imagining is a fun and useful exercise in art and life. How have you re-imagined something lately? 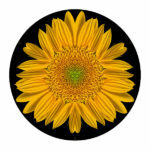 This entry was posted in Mandalas, Practicing, Seeing and tagged Flowers, Mandalas, Nature, Patterns, Sunflowers, Winter, Yellow on February 4, 2013 by gail.